Hello! 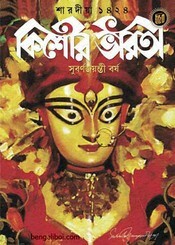 all my dear little and teenage friends, now I have brought a very special yearly Bangla magazine- Kishor Bharati Sharadia 2017 (1424) as pdf file, this traditional Bangali magazine published by Patra Bharati. We know that especially it is a monthly magazine but every year Patra Bharati publish a special issue before Durga Puja festival. Like every years in this year they published this exclusive story edition. This edition's cover stories are mainly on a lot of stories collection which are written by various eminent pen men as Premendra Mitra, Narayan Gangopadhyay, Ashapurna Debi, Shaktipada Rajguru, Mayuth Chowdhury, Khagendra Nath Mitra, Shivram Chakrabarti, Suchitra Bhattacharya, Shyamadas Dey, Nirad Hazra and many more. Comics, eight novels and many more topics. So sweet little readers can collect the above said Bangla Magazine as pdf from link below. The pdf has 460 HQ pages, 128mb file size.